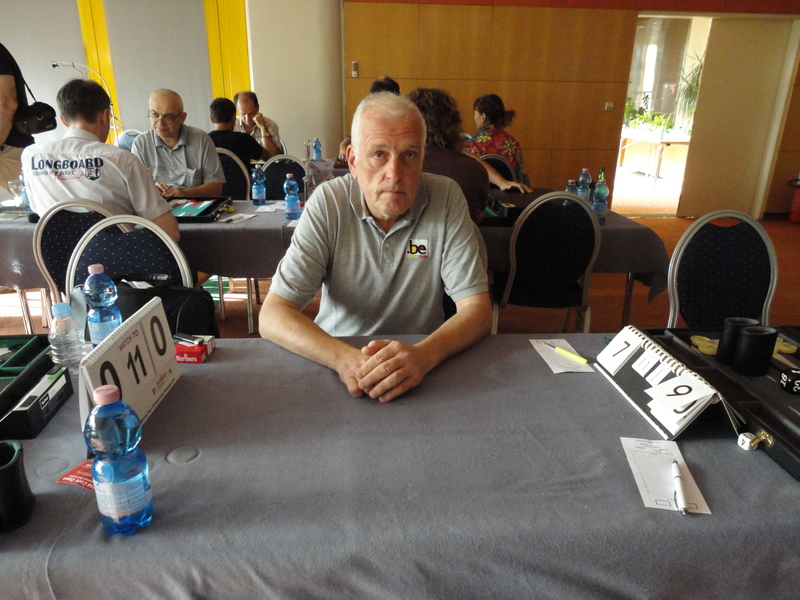 Belgium participates at the 2nd European Backgammon Team Championship in Budapest, Hungary. The team consists of : Guy Van Middelem (captain), Alain Chif, Michel Lamote, Walter Meuwis, Luc Palmans, Maurits Pino, Zsolt Tasnadi and Geert Van der Stricht. Luc Palmans will provide daily updates. It’s after midnight. The first day of the Budapest tournament has finished, and contemplating in my hotel room, enjoying a glorious panorama of the Danube and the Margaritha Island by night, I let my Waterman fountain pen go its own way and inform you about the events so far. Every second hotel in Budapest has “Danube” in its name, and after a lot of confusion, we managed ultimately to detect the correct one. It is a modern hotel with all facilities situated at the border of the Danube in Pest. Sadly, it takes a half hour stroll to reach the centre. Which is of course a pleasure with temperatures of 30°, a lovely sun and refreshing wind. No matter how hard I tried, pushing and turning and pulling and swearing, it just didn’t work. “No problem,” the cleaning lady informed me and after a forceful hit, which you only see in the decisive fight in a kung fu-film, the system suddenly worked. I learned my first lesson in Hungary: never mess with Hungarian women. The main event is of course the team tournament, which starts Friday, and we will discuss it in the next report. Thursday there was the “Budapest Open” – more or less a regular individual tournament. There is a Masters division (330 euro registration –rather cheap for a tournament of that level) and an Intermediate division (50 euro). The Masters with 48 players was well attended with a lot of world top class players. The Intermediate had 32 players. But that’s only the beginning of the story. Here are the facts: Masters was the traditional system with a main and a fighters bracket. When you lose twice, you are out. When you lose once, you still have a chance for the tournament win. First round 13 points. Here are the facts: Intermediate: Swiss system, 7 rounds, 9 points. Here is the reality: “9 rounds, 7 points”, but later it became the dreadful system with “3 losses and you are out”, and even later I was informed that it would only take 7 rounds (such a tournament normally needs 11 to 14 rounds to finish). 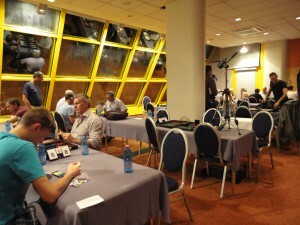 Registration, announcement of the draw and the rules, players in search for boards and clocks: it was quite a mess. And it could have been so easy: table numbers, correct pronunciation of the names of the players, etc. I will spare you all the details. After a delay of one hour we could start. In the corridor there was a lot of discussion about the organisation and the European Federation. I will discuss this matter in detail in a subsequent article. But I also have to admit that after the initial problems, the tournaments quickly found their natural flow. Michel and Geert didn’t participate, because they focus all their attention on the team tournament. Walter decided to play the Masters, because he lacked practice. Guy and your humble narrator followed him. Alain, Zsolt and Maurits preferred the intermediate, because they were guaranteed seven 9-point matches – at least they thought. But, as mentioned earlier, that would not be the case. In the intermediate division things went quite well for our members. Maurits finished the day with 4 wins and 1 loss; Zsolt with 3 wins and 2 losses. Alain was eliminated after some fierce battles with half of the Iceland population. Maurits received a free point after one of his opponents didn’t show up. At least one good decision by the tournament director. In the Masters Walter started with a good win against a Danish player, but lost to (also Danish) top player Thomas Kristensen. In the fighters bracket he could only win one game, and was then finally eliminated. Your humble narrator experienced his yearly loss against Norwegian Tore Frederiksen, and in the fighters bracket had to face two Romanian players. I could manage one, but the second was too much for me. 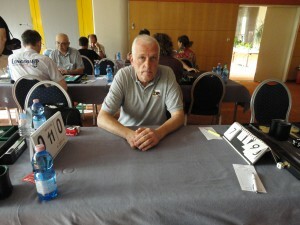 Guy had a good run, and after winning his first match, he beat German top player Jan Jakobowitz. But leading 9-1 against Norwegian Hans Liby, suddenly everything went completely wrong, and he lost the match. He will continue his struggle Friday morning in the fighters bracket. After working hours in the bar, we discussed the favourites for the nations tournament.Walter prefers the Germans. And while Orlowski, Hellwag and Jakobowitz are certainly good players, I consider the Danes Kristensen, Bredahl and Gronbech the better players. The future will tell. Latest news: this morning at 10 o’clock I had a short visit to the tournament hall. Yesterday we played in two rather small rooms – but still sufficient for the number of players. This entry was posted in EUBGF and tagged Budapest. Bookmark the permalink. It seems the Danish have a live stream of one of their matches (link on the website of of the Danish federation). Is there some live streaming available or bracket updates?